The weather seems to have finally cooled down. And as the nights draw in, the food I want to cook and eat celebrates the mid-autumn vegetable haul: plump pumpkins, purple plums, gorgeous gourds and the last of the summery fruits. 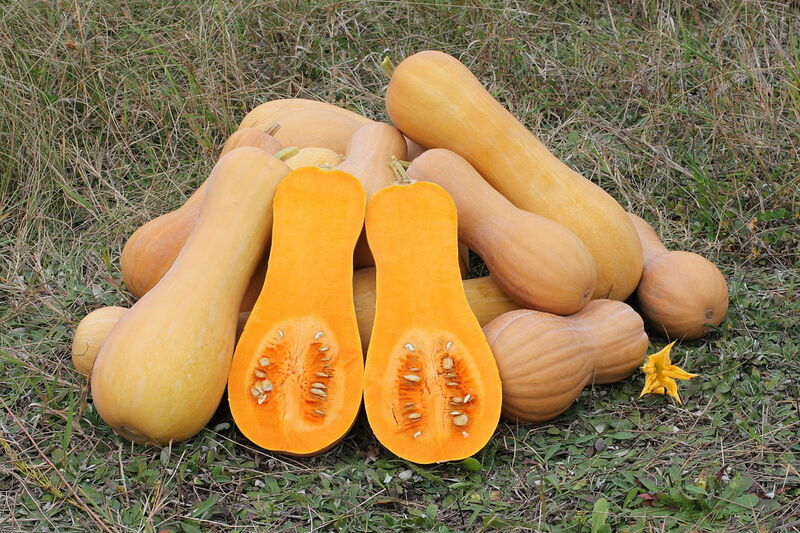 With pumpkins hogging the limelight in October and being resigned to be carved into jack-o-lanterns or used to flavour and thicken soups (puchero) I prefer to turn my attentions to other gourds and the most valued player of the gourd world is the butternut squash. Their golden orange hue reminding you that they’ve been soaking up the summer sun readying themselves for the autumn harvest. 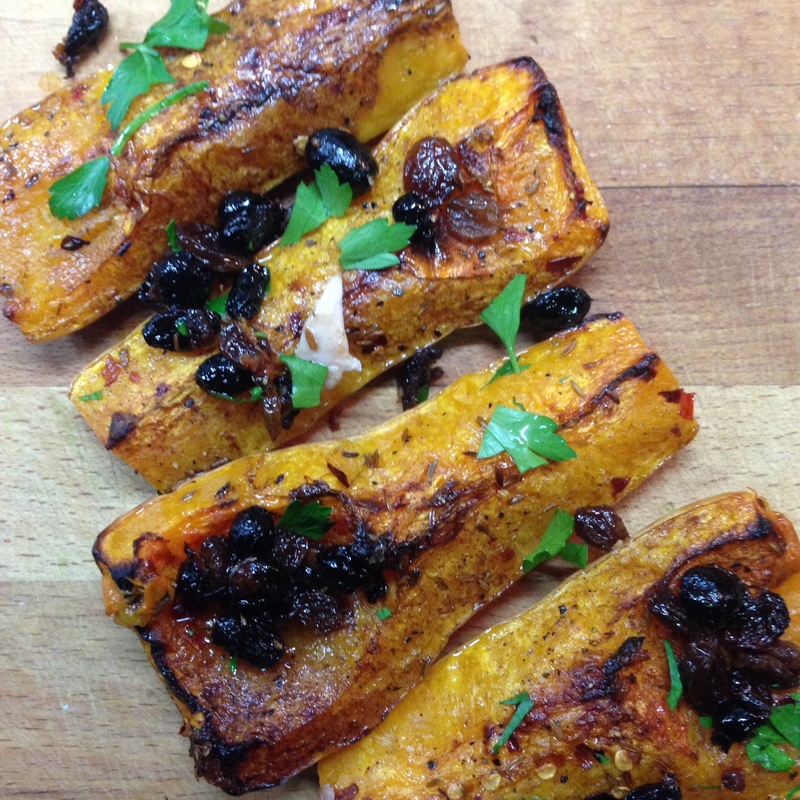 The butternut is a truly versatile vegetable. You can puree it, roast it, steam it, mash it, grill it – great in soups but also works as a vegetable side dish, or even as a main-course ingredient. In the past I have given recipes for Roast Garlic and Butternut Squash soup and Butternut Squash Risotto. I have also included a photo of a Roast butternut squash and lentil salad with chilli and rocket leaves from a cookery weekend at Food at 52 in London. However, today I have discovered the wonders of Moroccon spices with roasted squashes. 1st: Cut the squash in half and scoop out the seeds. 2nd: Cut the squash into quarters (so that they cook quicker) and place them cut-side up into an ovenproof dish. Dot with butter and season well. 3rd: Sprinkle with ground cinnamon, cumin seeds and sprinkle with dried chilli flakes. Use paprika or chilli powder as an alternative. Roast in the oven for 45mins at 210˚C. 4th: After 30mins, take them out and add a good sprinkling of sultanas and cook for a further 15mins. I served my roasted squash with roasted chicken thighs that were cooked together with the squash in the same oven dish until their skins were brown and crisp. Served immediately with some of the pan juices spooned over. A juicy and fragrant Lamb or beef tagine served with the roasted squash must be delicious. Definitely one to try again!